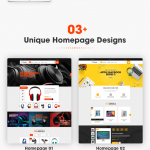 Hoker – is a premium magento 2 & 1 theme from Meigee suitable for any kind of store. Support is provided only via ticket system. All ticket are handled in queue, that’s why the reply make take up to two working days. Be patient please. Custom modules integration service is provided on paid basis and is not included in purchased theme support. We are available for the customization service but on paid basis. Contact us via [email protected] with all the details so we can provide you with terms and pricing.